Once, 🎵Everything was Awesome 🎵, until our favorite team of Legos went up against the menacing Duplos! After their Lego-land was destroyed, the team opens the movie as residents of Apocalypseburg. In survival mode the team must live with their guards up constantly, but their guard will not be enough when General Mayhem (Stephanie Beatriz) invades Apocalypseburg and Lego-naps the team. All except Emmet (Chris Pratt). This is a sponsored giveaway post, be sure to enter below. General Mayhem takes the team: Lucy (Elizbaeth Banks), Batman (Will Arnett), Unikitty (Alison Brie) and several others, to the Systar System with hopes of a better, safer life free of destruction. But there is a brick-in-the-wall: Batman must marry the Queen Watevra Wa-Nabi (Tiffany Haddish) of the Systar System. But can Batman commit? Do the Queen and General Mayhem have the best interest of the Lego team? While the Lego team is figuring out who the Legos of the Systar System are and what their intentions may be, Emmet is figuring out how to reach the team and rescue his friends, and his most special friend, Lucy. Unfortunately Emmet doubts his ability to be as strong as his friends, but finds guidance from Rex Dangervest (Chris Pratt) as he makes his way across the Lego galaxy to the very glittered Systar System. Although Emmet begins to believe in his abilities to make it to the new system and rescue his friends, his premonition of Ar-mom-ageddon destroying their world continues to plague him as he makes his journey. Lego Movie 2 is an inordinately self-aware comedy, and it works incredibly well to tell an entertaining story with genuine heart. With layered references, some for the kids and some for the adults, the writing is clever. The story teaches us all to believe in ourselves, while also speaking to how to be in relationship with each other, whether spouses, siblings, or friends. Lego Movie 2 will make you laugh, and remind you and your kiddos of valuable lessons in life. And most importantly it teaches you to never lose your heart for imagination. 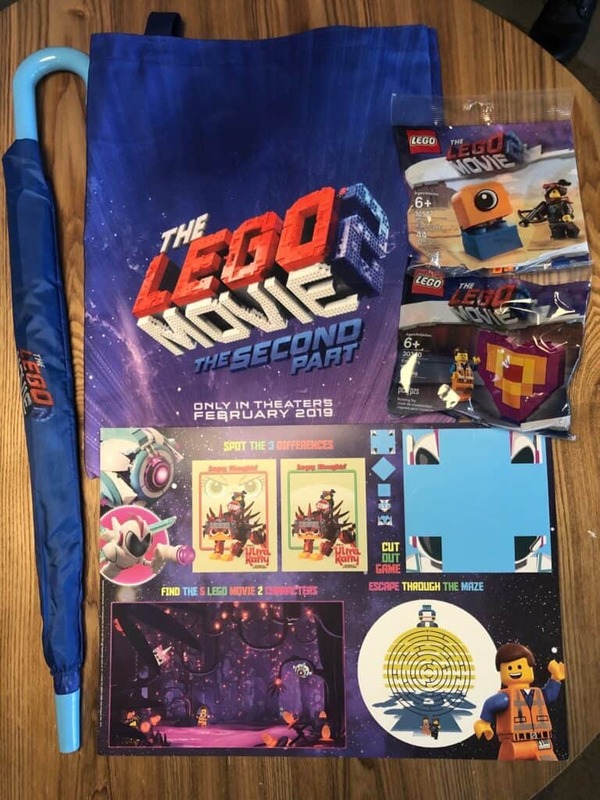 The Lego Movie 2: The Second Part is out in theatres this Friday February 8th. We have sponsored Lego giveaway to give to one lucky reader! Be sure to enter to win the prize pack below! The Lego Batman Movie. The kids loved it and still watch the DVD we bought. Lego Batman is my favorite lego movie. It was funny. The Lego Ninjago Movie was my favorite. The Lego Batman movie was my favorite but they are all great. My son and I saw Lego Batman together so it’s my favorite. I like Nijago and Lego Batman. I love the Lego Batman Movie! The Lego Batman is my favorite! The first LEGO movie was my favorite, but we’re planning to see LEGO Movie 2 tomorrow, so it might take the new spot! I like the original lego movie and Lego Batman. My son’s favorite is the Lego Batman. Lego Batman is the best! My nephew liked the Batman Lego movie a lot. My son loves the Ninjago ones! LEGO Batman is are favorite! The first one was good! Our favorite LEGO movie is LEGO Batman! I like the Lego Batman movie. My favorite LEGO Movie is the original one!